You haven’t heard much from me over these last couple weeks. And it’s not just because I’ve been recovering from the hangover of the Red Sox winning the World Series. I and my fellow testers have been wrapping up evaluations of everything from aero to climbing to all-around carbon wheels to a set of gravel hoops for good measure. I’ve also been trying out a half dozen pair of dual Boa road cycling shoes kindly sent to me by the good people at Competitive Cyclist. In the background, I’m keeping a few developers busy preparing an addition to the site that I hope will make your cycling budget go further and your shopping easier. More on that in the next few weeks. Meanwhile, it’s that time of year when bike stores are promoting deals for Black Friday, Cyber Monday, Christmas holidays and for what seems like no reason at all other than that they want more of your money. If you buy from online bike stores, no doubt your email and social media feeds are full of these promotions. Some of these deals look good and indeed are. But there are a lot of promotions going on now for gear that is selling at the same price it was without the promotion and sales for things you may not have thought you needed, and probably don’t. In the middle of the onslaught of sale/deal/promo hype this time of year, I wanted to share all the “good stuff” with you in one post. These are the best performing or best value wheels, clothes, components and other gear and kit that I and my fellow enthusiasts Nate and Moose recommended from all of that we’ve evaluated to keep you riding at your best. In the list that follows, you can click on any product name to go to the full review. Clicking on the store name will take you straight to the product page at the stores that have this “good stuff” at the best prices, including whatever discounts they have going on. These are also the stores that your fellow cyclists have rated amongst the best in customer satisfaction. And those in red support what we are doing for you here at In The Know Cycling by providing a small amount back to us to buy more gear to review and keep the site running, but only when you buy through these links. I normally end by saying enjoy your ride safely. Today, let me add, enjoy your shopping smartly. Upgrade Best Value – Campagnolo Zonda C17 – A stiff wheelset comfortable enough for both Moose and Squirrel. Best prices of about USD$450/£320/€390 at Chain Reaction Cycles, Wiggle, Merlin, Tredz 10% off w/code ITK10. All-around Best Performer – Zipp 303 NSW – Same name, new attributes, still top performance. Best prices of about USD$3200/£2200/€2600 at Competitive Cyclist, Amazon and in UK/EU at Tredz, Slane. All-around Best Performer – Bontrager Aeolus XXX4 – Recalling memories of driving a Corvette. Best price of USD$2400 at Trekbikes.com. Climbing Best Performer– ENVE SES 3.4 – Superior stiffness, aero and braking performance in a climbing wheelset. Best prices of about USD$2900/£3100/€3500 at Competitive Cyclist, Tweeks, Merlin or directly from ENVE.com. Trade in any carbon or alloy wheelset and receive a $700 credit towards the purchase of new ENVE wheelset from 11/23 through 11/26 under the ENVE upgrade program. Climbing Best Value – Mavic Ksyrium Pro Carbon SL C – Very good dry road braking and stiffness at a great price. Best prices of about USD$2200/£1200/€1400 at Amazon and in the UK/EU at Chain Reaction Cycles, Wiggle, Slane. Upgrade Best Performer – Zipp 30 Course Disc-Brake – Stiff, responsive, comfortable and versatile. Best prices of about USD$1000/£690/€760 at Competitive Cyclist, UK/EU Tweeks. Upgrade Best Value – Mavic Ksyrium Elite Disc UST – Comfortable and stiff at a good price. Best prices of about USD$700/£500/€550 at Amazon, eBay, UK/EU Chain Reaction Cycles, Tweeks. All-around Best Performer – ENVE SES 4.5 AR Disc – Performance and versatility that’s hard to beat. Best prices of about USD$2900/£3100/€3500 at Competitive Cyclist, Merlin or directly from ENVE.com. Trade in any carbon or alloy wheelset and receive a $700 credit towards the purchase of new ENVE wheelset from 11/23 through 11/26 under the ENVE upgrade program. Tubeless Best Performer – Zipp Tangente Speed Road Tubeless – Superior road feel (comfort, handling, grip, road noise) and competitive rolling resistance. Best prices of about USD$62/£37/€44 at Competitive Cyclist, Amazon, eBay, UK/EU Wiggle. Tubeless Best Value – Schwalbe Pro One – Competitive rolling resistance, comfortable good handling but buzzy and not as long-lasting. Best prices of about USD$49/£37/€47 at Competitive Cyclist 10% off w/code ITKC10, Amazon, Chain Reaction Cycles. Tubed Clincher Best Performer – Michelin Power Competition. Best prices at Competitive Cyclist 10% off w/code ITKC10, eBay Cycling, Amazon, Wiggle, Chain Reaction Cycles. Tubed Clincher Best Performer – Continental Grand Prix 4000S II. Best prices at Competitive Cyclist 10% off w/code ITKC10, eBay Cycling, Amazon, Wiggle, Tweeks Cycles, Chain Reaction Cycles. Recommended spring/summer bibs – Assos T Equipe Evo – Just when you thought it couldn’t get better. Best price about USD$219/£150/€170 at US/CA Competitive Cyclist, UK/EU Wiggle, Chain Reaction. Recommended cool weather bibs – Assos T.tiburuShorts_s7 Bib Shorts. An amazingly comfortable, wonderfully executed pair of bibs. Best price about USD$249/£185/€215 at Competitive Cyclist, UK/EU Wiggle, Chain Reaction Cycles. Recommended cool weather tights – Castelli Sorpasso 2 Bib Tights – Nearly as comfortable as riding with bib shorts and a lot more comfortable than wearing leg warmers. Best price about USD$180/£150/€180 Competitive Cyclist 10% of with code ITKC10, Wiggle, Chain Reaction Cycles, Tredz 10% of with code ITK10. Recommended cool weather base layer – Assos LS.skinFoil_Spring_Fall s7 – Body Insulator – The skin fit and feeling you get is kind of like my base layer telling me it’s “go time” and it works. Best prices of around USD$95/£89/€75 at Competitive Cyclist, UK/EU Wiggle, Chain Reaction Cycles. Recommended – Kask Protone – The top-performing aero road helmet that also looks more like a standard one. Best prices USD$200/£155/€185 at Competitive Cyclist 10% off w/code ITKC10, UK/EU Wiggle. Recommended – POC Ventral SPIN – If you like the look, one of the coolest, quietest and most comfortable helmets you can wear. Best prices USD$290/£180/€210 at Competitive Cyclist, Chain Reaction Cycles, Wiggle, Tredz 10% off w/code ITK10. Recommended – Scott Cadence PLUS – Excellent performance amidst a contrary design. Best prices USD$150/£129/€250 at Competitive Cyclist, 10% off w/code ITKC10, JensonUSA, Tredz. Mechanical Rim Brake Best Value – Ultegra 8000 – Best prices at Competitive Cyclist 10% off w/code ITKC10, Chain Reaction Cycles, Merlin. Mechanical Rim Brake Best Performer – Dura-Ace 9100 – Best prices at Competitive Cyclist 10% off w/code ITKC10, Chain Reaction Cycles, Wiggle, Merlin. Electronic Rim Brake Best Value – Shimano Ultegra R8050 Di2 – Best prices at Competitive Cyclist 10% off w/code ITKC10, Chain Reaction Cycles, Merlin. Mechanical Disc Brake Best Value – Ultegra 8020 – Best prices at Chain Reaction Cycles, Wiggle. Mechanical Disc Brake Best Performer – Dura-Ace 9120 – Best prices at Mantel UK. Electronic Disc Brake Best Value – Shimano Ultegra R8070 Di2 – Best prices at Merlin, Mantel UK. Electronic Disc Brake Best Performer – Shimano Dura-Ace R9170 Di2 – Best prices at Competitive Cyclist 10% off w/code ITKC10, Merlin. Recommended – Shimano Ultegra PD-R8000 – Perform well, suit the fit needs of most cyclists, very durable, easy to maintain. Best prices USD$180/£86/€105 at Competitive Cyclist 10% off w/code ITKC10, JensonUSA, Chain Reaction Cycles, Wiggle. Recommended – Speedplay Zero Chrome-Moly – If your biomechanics or bad knees require a fit solution somewhat outside the norm or you just prefer pedals you can clip in from either side with near near-frictionless float. Best prices USD$144/£105/€125 at Competitive Cyclist, UK/EU Merlin, Chain Reaction Cycles, Wiggle. Best Performer – Quarq DZero and DFour – Best/list prices for DZero spider USD$679/£583/€689, with alloy arms USD$779/£693/€818, with carbon arms USD$1079/£858/€1013 at Competitive Cyclist (spider), Competitive Cyclist (crankset), UK/EU Chain Reaction Cycles, Wiggle, Merlin, Tredz 10% off w/code ITK10. Best/list prices for DFour $/£/€100 more at Competitive Cyclist UK/EU Wiggle, Merlin, Tredz 10% off w/code ITK10. Best Value – 4iiii Precision – Best prices of about USD$500/£465/€530 for single-sided Precision Shimano Ultegra R8000 model at Power Meter City 10% off w/code ITK10, Merlin. Better prices for last gen Shimano Dura Ace, Ultegra, 105 models. Best Value Alternative – Stages – Costs about 10-20% more than 4iiii but covers a wider range of crankset brands and also makes carbon arms. Single or dual sided. Best prices at Competitive Cyclist, Power Meter City 10% off w/code ITK10, Tredz 10% off w/code ITK10, Chain Reaction. Better prices for last gen Shimano Dura Ace, Ultegra, 105 models. Best Expandable – Favero Assioma – Single-sided pedal power meter that can be expanded later to dual-sided with purchase of right pedal. Best prices USD$519 at Power Meter City with 10% credit toward next purchase w/code ITK10. 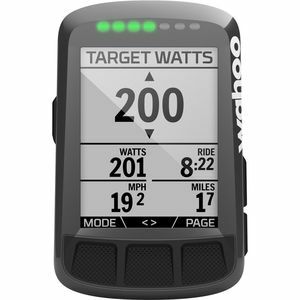 Recommended GPS Computer – Wahoo Elemnt Bolt – Better screens, buttons, set-up and battery than Garmins in a 520 size form factor with good navigation priced below 520 Plus. Best prices USD$250/£190/€220 at Competitive Cyclist, REI, Chain Reaction Cycles, Wiggle. – 20% to 25% off at Competitive Cyclist from Black Friday (11/23) thru Cyber Monday (11/26) on major brands of wheels (HED, Reynolds) clothing (Castelli, Gore Bike Wear, Pearl Izumi, Shimano Apparel, Giordana, Garneau, Fox Racing), helmets (Smith, POC, Giro Pinnacle, Fox Racing), shoes (Sidi, Garneau, Scott), power meters (Stages), and racks (Thule, Yakima, Rocky Mounts). – 10% off items store-wide one-time exclusively for In The Know Cycling readers at Competitive Cyclist. Code ITKC10. Exclusions. – 10% off store-wide anytime exclusively for In The Know Cycling readers at Tredz on purchases over £50. Code ITK10. Exclusions. – 10% off power meters anytime exclusively for In The Know Cycling readers at Power Meter City. Code ITK10. Garmin and Favero buyers receive 10% credit by entering the same code in the order notes. – 30%+ on selected bikes and frames at Competitive Cyclist. You mention that the ENVE trade up program accepts carbon or alloy wheel sets, however their website states Carbon in the header. Do you have any information that says specifically that they also accept alloy wheels? I’ve got a pair of 2015 Fulcrum Racing Zero Nite wheels which I really love, but would love to splurge on a pair of ENVE 3.4s. Saving $700 would go a long way! Hi Steve, just an FYI – the Continental Grand Prix 4000S II are no longer in production. These are replaced by the Continental Grand Prix 5000.